A tribute to The Royal and Ancient Game of Golf. Everything has been said and written about the beauty, the greatness, the magnificence, and the history of The Old Course. The only thing is absolutely impossible to describe are the incredible and unique number of emotions and sensations I felt walking and playing "The Old Lady". Teeing off in front of hundreds people watching me on the 1st tee, putting on the great double greens, trying to escape from the 8 foot high "Shell Bunker" on the 7th or trying to avoid one of the 112 bunkers, the intimidating tee shot over the "Old Course Hotel" on the Road Hole 17th, crossing the Swilcan Bridge or putting for birdie on the 18th. A number of memorable moments, on the footsteps of the greatest golfers. St. Andrews is the Home Of Golf. The Old Course is the birthplace of golf, the place where everything started. You can feel it, you can sense it as soon as you stare at the R&A Clubhouse. For more then 600 years people have been playing golf on the Links land on the north west of St. Andrews. In the past the area known as the Links was used for many things, from sheep and rabbit farming to laundry, but from the 16th Century golf was becoming to be the most popular activity. 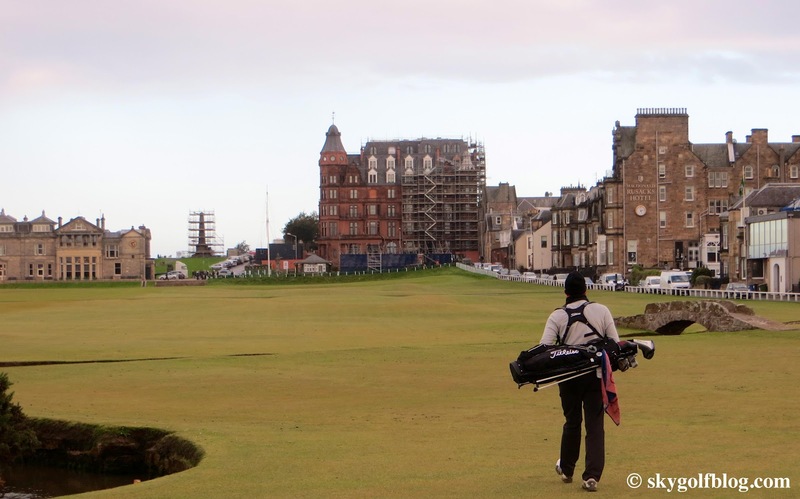 The designer of the Old Course is said to be Mother Nature herself. And the men over the years transformed it into one of the greatest courses on earth. It is not known exactly when of The Old Course developed. In 1764 it consisted of twelve holes, ten of which were played twice, making a round of twenty two holes in all. This is when the members decided to combine four short holes in two holes creating an eighteen holes golf course...today's standard. In 1854 the R&A Clubhouse was completed. Significant changes have been made by Old Tom Morris around 1863. He designed the present layout by separating 1st and the 17th green, creating new teeing areas and changing direction of play from clockwise to today's counterclockwise. In 1873 hosted the first "The Open Championship". Since then "The Open" came back to The Old Course for 27 times. And it will return once more in 2015 and every five years. It has been a real privilege for me playing The Old Course. The Old Course Hotel "protection"
Hey i golfed with you at St. Andrews, I've been meaning to message you for months but have been very busy! How have you been? Great photos, I'm jealous of all of the great courses you've played. If you have any extra photos of The Old Course i would love to see them. My email is justin_gagne16@hotmail.com. If you have a free moment please message me back.